In its first seven months of operation, the Dakota Access Pipeline has generated an additional $73 million in oil tax revenue in North Dakota. 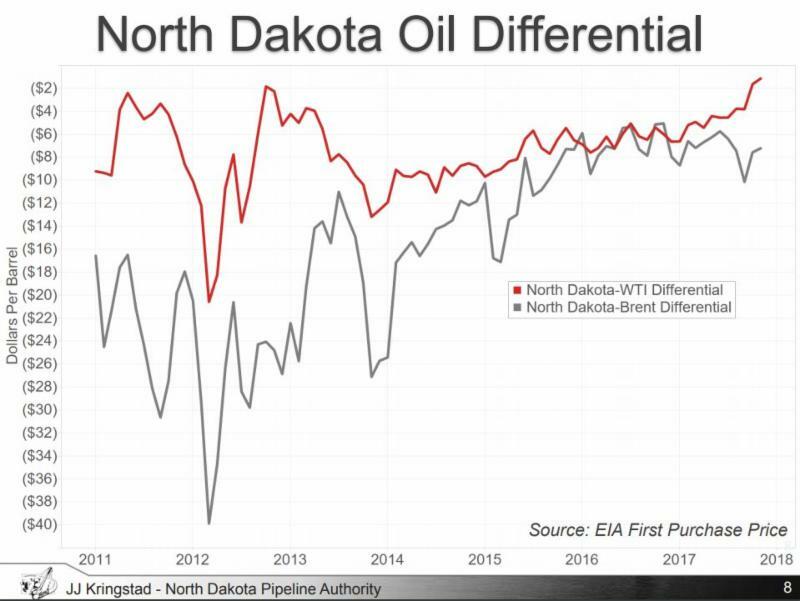 That’s because North Dakota producers are enjoying higher prices for crude because moving oil by pipeline costs much less than transporting it by rail. Before DAPL went into service last summer, the price differential between North Dakota crude and other industry benchmarks had been as high as $20/barrel. But that number dropped quickly when Dakota Access became operational. The discount on a barrel of Bakken crude dropped from an average of $7.73 before DAPL, to $4.53 after it went into operation, according to Justin Kringstad, director of the ND Pipeline Authority. At its peak in 2014, more than 800,000 barrels per day moved by rail. But Kringstad says that figure has now dropped to about 100,000 barrels per day. Pipeline takeaway capacity currently exceeds the state’s crude oil production, but that excess capacity could disappear as early as 2020 if projected increases in production occur. Click here to download Kringstad's latest slide presentation on Bakken economics. The election of Donald Trump in 2016 took a lot of pressure off the coal industry, but that doesn’t mean communities that depend on coal for their livelihood can let their guard down. That was the message delivered by coal industry reps at last week’s meeting of the Vision West Consortium in Beulah. The Trump Administration ended the “War on Coal” with its withdrawal from the Paris Climate Accord and halting implementation of the Obama EPA Clean Power Plan. 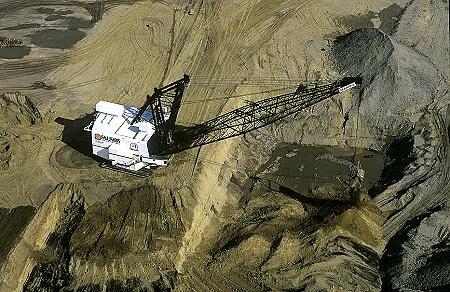 But industry leaders like North American Coal’s government affairs manager David Straley say there’s more work to do. He wants to make the sure the public doesn’t take the industry for granted. That work includes a continuous effort to educate the public about the contribution of lignite to the region’s economy. Jonathan Fortner, government affairs manager for the Lignite Energy Council, says a big part of the effort is focused on Minnesota which imports much of its electricity from coal plants in North Dakota. Fortner says the outreach will include a tour this summer for Minnesota legislators. Click here to listen to Fortner’s comments. Coal mining and coal-fired power generation represent the fifth largest industry in North Dakota, behind agriculture, oil & gas, tourism and manufacturing. Click here to learn more about the coal industry’s outreach efforts. A Texas company has purchased a crude oil transload terminal in Mountrail County, and plans to convert it to a frac sand transport facility. 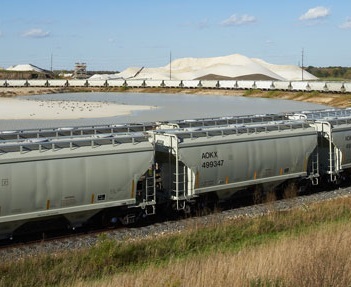 Smart Sand Inc. paid $15.5 million to acquire the Van Hook terminal, and has entered into an agreement with Canadian Pacific Railway to service the site. The company expects to have the facility operational in April. “We are excited to partner with transportation leader CP to offer our customers competitive, efficient rail service for our Northern White Frac Sand to operating basins throughout North America," said Charles Young, CEO of Smart Sand. Northern White sand comes from Wisconsin, where Smart Sand Inc. holds a large reserve. 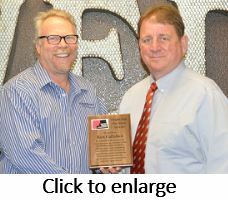 Click here to see Smart Sand’s web page. Birth rates in North Dakota’s oil-producing region have soared in recent years, reflecting the large influx of oil industry workers, most of whom are of child-rearing age. The number of children born in McKenzie County, located at the heart of the Bakken, has more than quadrupled, from just 60 births reported in 2007, to 245 babies born in 2016. Birth rates in other parts of western North Dakota have more than doubled since the oil boom began. There were 712 babies born in Williams County in 2016, compared to only 306 in 2007. Stark County saw 549 births in 2016, compared to 290 in 2007. 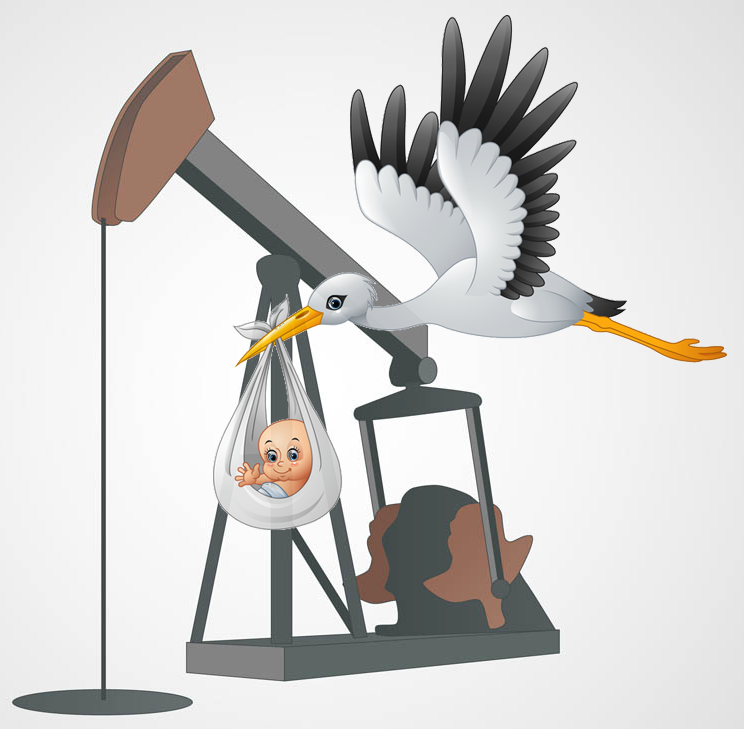 The surge in births is putting a lot of pressure on school districts in the oil-producing region, many of which have expanded or built new elementary schools, with more in the planning stages. 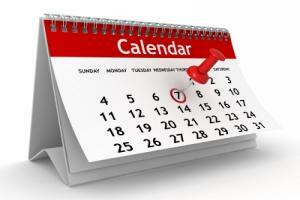 Click here to see a report on K-12 school enrollment from the Department of Public Instruction. A proposed in-patient behavioral health treatment facility in McKenzie County may soon fill a regional gap in addiction and mental health counseling services. Summit Counseling Services plans to establish the outpatient facility on a 20-acre plot in what was formerly a residential "man camp" near Alexander. Summit currently provides outpatient services in Williston, Tioga, Stanley and Watford City. This would be the first in-patient operation for Summit. “We’re excited. We’ve been working three years to find a place for a treatment facility. Every day we turn down requests for in-patient treatment,” said Founder and Director of Operations George Owen. “These rural communities are not being served at all. Addiction is the biggest need." The expanded operation will help oilfield companies that want to offer behavioral health services to their employees. The in-patient facility will also hire at least 20 employees. The opening date is still at least a year out. The first goal is to pay for the building by June 15. 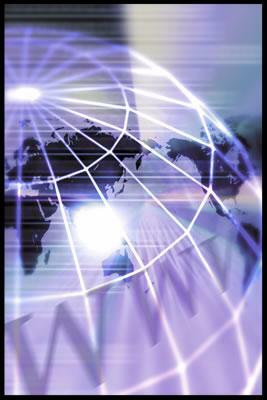 Click here for a report from KX News. 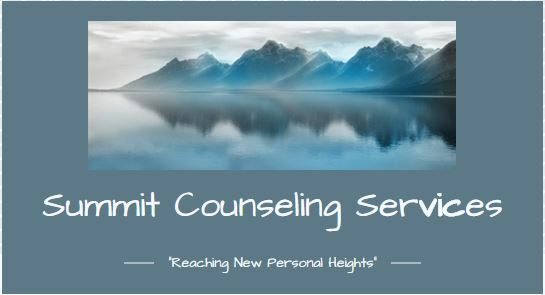 Click here for more about Summit Counseling Services. Plans by ONEOK Inc. to more than double the gas processing capacity of its Bear Creek Plant in Dunn County received a lot of local support at a hearing this week. The ND Public Service Commission held a public meeting Wednesday in Killdeer to discuss ONEOK’s plan to expand the plant’s capacity from 80 million cubic feet per day to 175 million cubic feet. Dunn County Commissioner Daryl Dukart said ONEOK has been a good community supporter, and currently employs about 20 local residents at the plant. "At the end of the project when it is completed, we are hopefully going to see some additional employment,” Dukart said. The gas plant expansion is in its early stages, but the company hopes to break ground in August. Click here for a report on the hearing from KX News. After a 45-day comment period by the North Dakota Department of Health (NDDoH), Meridian Energy reports it has responded to all the comments on its proposed refinery near Belfield. According to Meridian, 97.5 percent of the comments were “form letters," such as email blasts from various member-based websites. One organization submitted 10,068 form letters via email through its website, accounting for 93% of the total comments. 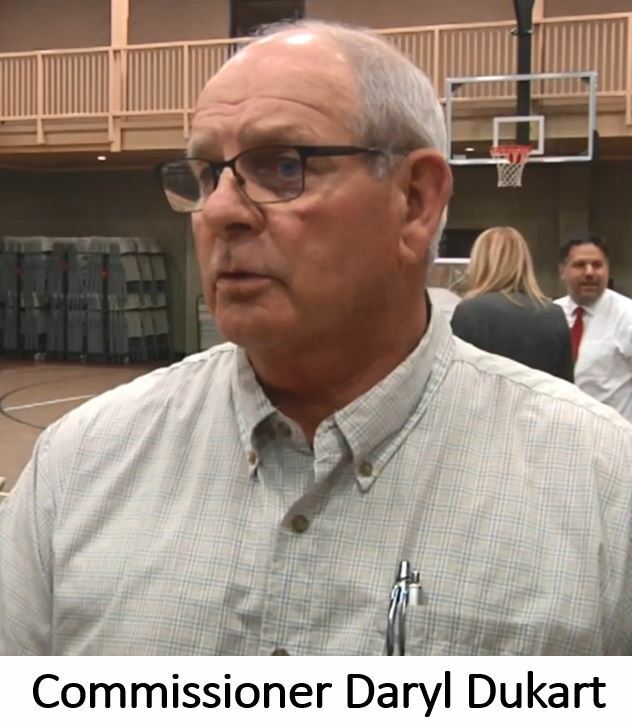 Meridian officials said said none of the form emails contained comments relevant to the technical or legal basis for the Draft Permit to Construct issued by NDDoH in December. "The process of reviewing and analyzing nearly 11,000 comments received by NDDoH was almost as exhausting as the application review process itself," said Meridian CEO William Prentice. The analysis showed 1.8% of the comments received were from North Dakota respondents. More than 22% were from the west coast, specifically Oregon, Washington and California. Click here for a Meridian Energy news release about the comment response process. Click here for a story on the status of a water permit for the proposed refinery. 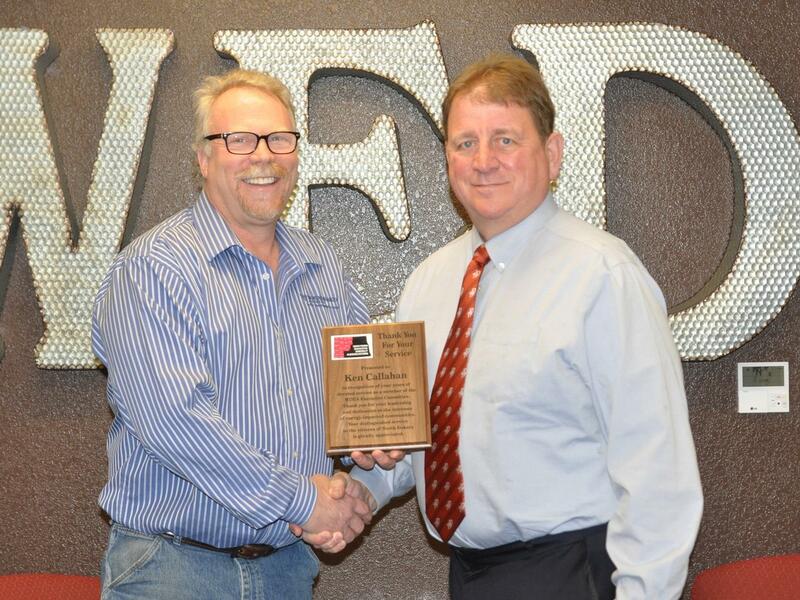 Williston resident Ken Callahan, who represented the city as a member of the WDEA Executive Committee, recently received thanks for his service from Mayor Howard Klug. Callahan served three years as a WDEA board member. Known by many as "Mr. Williston," Ken was an active board member during his tenure and remains active in the region as energy services manager for Montana-Dakota Utilities. Callahan's seat on the WDEA board was filled at last fall's annual meeting by Shannon Holter, a member of the Bowbells City Council. 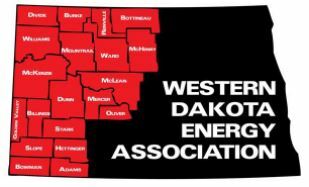 The WDEA Executive Committee includes three members each representing counties, cities and school districts, as well as two representatives from the coal conversion counties. Another past board member, Bottineau School Superintendent Jason Kersten, was also recognized for his years of service to WDEA. Kersten's board seat was filled by Alexander Superintendent Leslie Bieber. Frac sand must meet demanding specifications, with grain size perfectly matched to job requirements. It must have a spherical shape that enables it to be carried in hydraulic fracturing fluid, and durability to resist crushing forces of closing fractures. 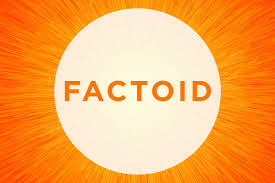 Most frac sand is between 0.4 and 0.8 millimeters in size.